Its interesting living in a country whose leadership is unwilling to guide developments in the social, political, cultural and economic institutions of the state. Of course, most people would be scared at living in a country whose leadership has taken a leave of absence. For the political scientist, the unravelling of a state provides interesting study opportunities comparable to observing the birth of a state. Most Kenyans are familiar with author George Orwell because of his book, “Animal Farm,” widely used in English literature. Few Kenyans, however, have read the book, “1984,” also by Orwell. 1984 was written in the 1940s, in the aftermath of World War 2 but many of the things Orwell predicted are becoming reality. In his book, Orwell explains the four ways in which states collapse. The first, and most obvious, is an invasion by another state with greater military power. The second is when a ruling class governs so inefficiently that the masses are stirred to revolt. The third is when a ruler allows a strong and discontented middle class to come into being. The fourth way in which a state can collapse, and which is relevant to Kenya, is when the ruling classes lose their own self confidence and willingness to govern. Ultimately the determining factor as to whether a state survives or collapses is the mental attitude of the ruling class itself. Coming back (or is it down?) to our beloved country, we are very unlikely to be invaded by another state. Most of our neighbours have their own problems and such an invasion would not be recognized by the international community. Considering the conduct of our so-called leaders, the three other factors written by Orwell are cause for worry. The Kenyan state is governed so inefficiently that its a wonder it has lasted so long. There are no priorities other than the short-term gratification of the political class. Billions of shillings are spent in propping up a bloated government filled with ethnic warlords whose academic qualifications are in doubt. Cabinet ministers appoint their poorly educated relatives and tribesfolk into positions that demand technical expertise. Not surprisingly, such appointees spend more time thinking of ways to earn money than in improving service delivery. New districts are being created left, right and centre. Most of the new districts are created as personal fiefdoms for prominent families and powerful politicians. For example, Thika District for the Kenyatta family, Mbeere for the Nyagas, Vihiga for the Mudavadis, Bondo for the Odingas and Ijara for Defence Minister Yussuf Haji. Transmara was created for Sunkuli, Bomet for the late Kipkalya Kones and Mwingi for Kalonzo Musyoka. By 1990, Kenya had 42 administrative districts. Today, the country’s provincial administration does not know the exact number of districts but the figure is close to 200. While campaigning for a second term in 2007, President Kibaki created districts for almost every sub-tribe in Kenya. During the same campaigns, Vice President Kalonzo Musyoka promised to turn every constituency into a district. The railway system, built by the British Empire a century ago, has all but collapsed after years of neglect. The education system suffers from under-investment in new facilities and teacher training. Kenya’s cities are receiving less water today than was the case a decade ago. Electricity supply, which is normally erratic, has become extremely expensive. Inefficient administration coupled with blatant opportunism has made Kenya’s middle class greatly disenchanted. According to Orwell, this is a factor that could bring down the rotting edifice of Kenya’s statehood. The middle class is made up of educated young and middle-aged citizens more interested in globalization than in the antics of tribal politics. The middle class want Kenya to play its rightful role in the international community by contributing towards a technologically driven society with equal opportunities for every body. The values of individual rights, justice, democracy and liberty are of significant importance to the middle class, as indeed, they should be for everybody. As matters currently stand, Kenya in its present form is unlikely to make these achievements. It is clear that Kenya’s leadership is no longer confident about itself and has lost the willingness to govern. Quite frankly, we at the Nairobi Chronicle, confidently state that Kenya’s leaders are an utter failure. The country is suffering from a vacuum in leadership – we live in a leadership desert. This statement is not meant to criticize Kibaki alone, but it applies across the entire spectrum of Kenya’s political leaders. In all sincerity, who among the political chest-thumping classes can we trust with the task of achieving Vision 2030? 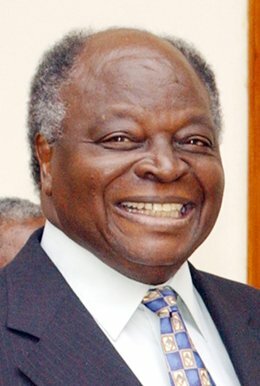 Is it Kibaki? What about Raila and Kalonzo? Can William Ruto, Martha Karua, Mudavadi, Balala or Mungatana do it? We don’t think so and most Kenyans privately agree with us. According to world standards, one of the signs of a failed state is infighting within the ruling classes. For this alone, Kenya has earned a right of place among the galaxy of failed states which include Somalia, Pakistan, Nigeria, Haiti, Sudan, among others. The formation of the Grand Coalition was a sign of failure. The Grand Coalition is driven by foreign powers because our Kenyan leaders wanted to sacrifice the country for selfish ends. A government driven by foreign diplomats is a clear indicator of non-existent leadership. To paraphrase Nigerian writer Wole Soyinka (or was it Chinua Achebe? ), the trouble with Kenya is first and foremost a failure in leadership. A country without an assertive leader is like a ship without a captain. Everybody does whatever they feel like doing. Decisions cannot be made in time and when action is finally taken, its usually irrelevant. Middlemen and conwomen emerge within government circles claiming to represent the ever-absent chief executive. The Kenyan government reaction to the capture of 33 tanks by Somali pirates is a case in point. Nobody knows where the tanks were going. Kenya’s military was caught unawares amidst infighting in the top command over promotions and recruitment. The US military based in Doha, Qatar, seems to have more information about the incident than our own government. Kenya’s ruling elite is largely composed of individuals who inherited power and wealth from departing British colonialists. In a bid to keep wealth within the family tree, there has been a great deal of political inheritance, with power handed down from father to son and mother to daughter. The rest of Kenyans are relegated to spectators and pawns in the power games of the rulers. With Somali pirates holding at ransom 33 powerful tanks and world powers staring helplessly, Kenya’s government is running around in circles amidst controversy over the true destination of the weapons. Last Thursday, Somali pirates seized a ship carrying more than 30 military tanks. Initial reports indicated the tanks were ordered by the government of Southern Sudan. Later on, Kenyan government spokesman Alfred Mutua confirmed that the tanks were heading to Kenya. “The cargo in the ship includes military hardware such as tanks and an assortment of spare parts for use by different branches of the Kenyan military,” Mutua said. The pirates from the Somali district of Puntland denied Kenya’s claims, citing documents within the ship pointing to the ultimate destination of the cargo as South Sudan. The United States, which has a warship actively monitoring the hijacked vessel, has announced that the deadly cargo was headed for South Sudan. What makes the saga intriguing is that Sudan is under a United Nations arms embargo; hence the government of South Sudan has categorically denied ownership of the arms shipment. Over the years, Kenya has been a close ally of the South Sudanese, right from the days of guerrilla conflict between the Sudan Peoples Liberation Movement and the Khartoum government. Press interviews with Kenyan military personnel shows that the Army neither ordered the tanks nor was it aware of an incoming shipment. On the other hand, it has been reported that Kenyan authorities are in possession of documents confirming ownership of the captured weaponry. Amidst this potentially explosive situation (no pun intended), Kenya’s political leadership is still immersed in its never-ending game of retrogressive ethnic politics. Hardly a word has been heard from President Mwai Kibaki. Meanwhile, Prime Minister Raila Odinga is engaged in maneuvering within the ODM party in readiness for the 2012 presidential elections. Vice President Kalonzo Musyoka has drawn the ire of many by insinuating that he was an ‘acting’ commander in chief while President Kibaki was attending the UN Heads of State summit in New York. It has been rumored that the tanks are indeed for the Kenyan military but were ordered without the knowledge of army chiefs by politically-connected persons. Military contracts tend to be highly lucrative due to secrecy in procurement. In spite of having suffered the side-effects of Somalia’s lawlessness in the past 17 years, Kenya has taken a complete back seat in the search for stability in the Horn of Africa. The Transitional Federal Government (TFG) crafted in Nairobi in 2004 was a patchwork of warlords with no interest in creating a peaceful society. TFG President Abdullahi Yussuf is the warlord for Puntland, where piracy activities are centered. Typical of its lack of foresight, the Kenyan government provided logistical support and intelligence that enabled the US and Ethiopia to remove the Islamists from power.